(NaturalNews) Nutritional researchers are continually examining naturally occurring compounds to determine their potential impact on human health. A number of nutrients have been found to provide critical antioxidant and anti-inflammatory support for cellular metabolism and lower disease risk for most chronic diseases such as heart disease, stroke, diabetes, cancer and dementia. Resveratrol sits high atop a short list of protective chemicals, as it has repeatedly demonstrated superior effectiveness as an aid to promote vibrant health. In the past, scientific studies on resveratrol have show that it lengthens the lifespan of diverse organisms ranging from unicellular yeast to fruit flies, mice and humans. 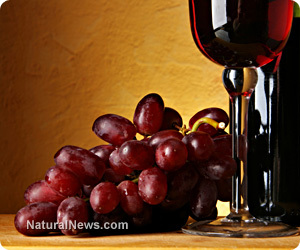 A group of scientists from Arizona State University, the Norwegian University of Life Sciences, and Harvard Medical School have published the result of a study in the journal Aging, that explains how the compound found in red wine and grapes alters food perception and calorie intake to provide an aid with weight management issues. The scientists tested the effects of resveratrol supplementation using honey bees and confirmed that not only does the compound extend the lifespan of honey bees by 33 to 38 percent, it also changes the decisions that bees make about food by triggering a "moderation effect" when they eat. Lead author, Dr. Brenda Rascon commented "For the first time, we conducted several tests on the effects of resveratrol by using the honey bee as a model...We were able to confirm that under normal living conditions, resveratrol lengthened lifespan in honey bees." Researchers know that resveratrol is a potent antioxidant that is capable of squelching the damaging effects of free radicals that are frequently released during periods of stress. Surprisingly, resveratrol did not extend the life of bees living under stressful conditions, so the scientists wanted to determine how resveratrol worked to extend life. They determined that resveratrol decreased sensitivity to sugar. Sugar promotes early disease development due to damaging sugar-protein cross links known as advanced glycation end products (AGE's). Resveratrol supplementation caused the bees to lose interest in gorging on sugar, effectively altering their perception to the enticing food source. The authors noted "Because what we eat is such an important contributor to our physical health, we looked at the bees' sensitivity to sugar and their willingness to consume it... bees typically gorge on sugar and while it's the best thing for them, we know that eating too much is not necessarily a good thing." Resveratrol has been touted as a calorie restriction mimic, and this study provides evidence that the compound acts as a natural caloric suppressor, likely by attenuating the desire for sugar and possibly by affecting insulin metabolism. Reduced calories from sugar and more efficient calorie metabolism lead to better control of body weight and lowered risk of overweight and obesity. Nutrition experts recommend 50 to 400 mg of a standardized resveratrol supplement each day to improve disease risk profile and help with weight management control. John Phillip is a Certified Nutritional Consultant and Health Researcher and Author who writes regularly on the cutting edge use of diet, lifestyle modifications and targeted supplementation to enhance and improve the quality and length of life. John is the author of 'Your Healthy Weight Loss Plan', a comprehensive EBook explaining how to use Diet, Exercise, Mind and Targeted Supplementation to achieve your weight loss goal. Visit My' target='_blank'>http://myoptimalhealthresource.blogspot.com/... Optimal Health Resource to continue reading the latest health news updates, and to download your copy of 'Your Healthy Weight Loss Plan'.